From. This is the sender of the email as it will appear to the recipient. Leave empty to use the system default – if a portal context is set, the portal administrator email is used, otherwise, the email defined in Host Settings is used. This field supports context tokens and My Tokens. To. Determines who will receive the email. Separate multiple email addressed with semicolon. 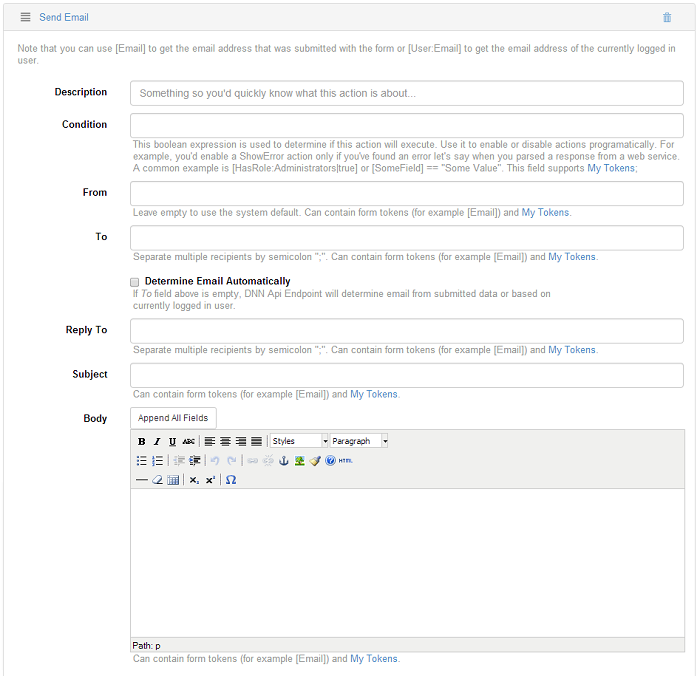 If the Determine Automatically option is used, then Sharp Scheduler tries to infer the email from the Context User. This field supports context tokens and My Tokens. Reply To. When the recipient of the email replies to this email, the To field fills with this email instead of the original From. This only makes sense when sending emails to non-admin users that are likely to reply to those emails. For example, it can be a trial reminder email. Separate multiple email addressed with semicolon. This field supports context tokens and My Tokens. Subject. Used as email subject. For best experience, choose something not too short but not too long either. This field supports context tokens and My Tokens. Body. This is the email content. If you need custom data then use other actions, for example the Run SQL action, to fetch it and store it in the job context. Then access it through the context tokens. This field also supports My Tokens.